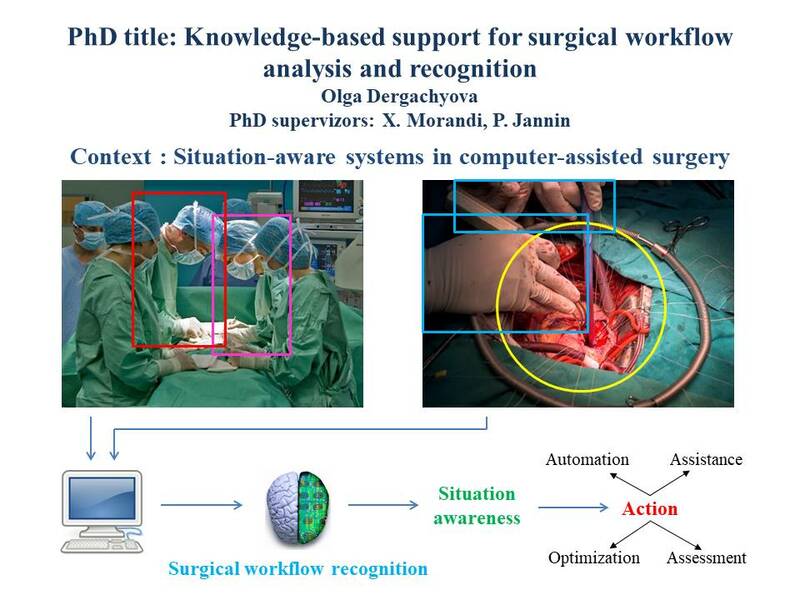 Title: Knowledge support for multi-granularity and real time modeling and recognition of surgical processes from multimodal sensors. Computer assistance became indispensable part of modern surgical procedures. Desire of creating new generation of intelligent operating rooms incited researchers to explore problems of automatic perception and understanding of surgical situations. Situation awareness includes automatic recognition of surgical workflow. A great progress was achieved in recognition of surgical phases and gestures. Yet, there is still a blank between these two granularity levels in the hierarchy of surgical process. Very few research is focused on surgical activities carrying important semantic information vital for situation understanding. Two important factors impede the progress. First, automatic recognition and prediction of surgical activities is a highly challenging task due to short duration of activities, their great number and a very complex workflow with multitude of possible execution and sequencing ways. Secondly, very limited amount of clinical data provides not enough information for successful learning and accurate recognition. 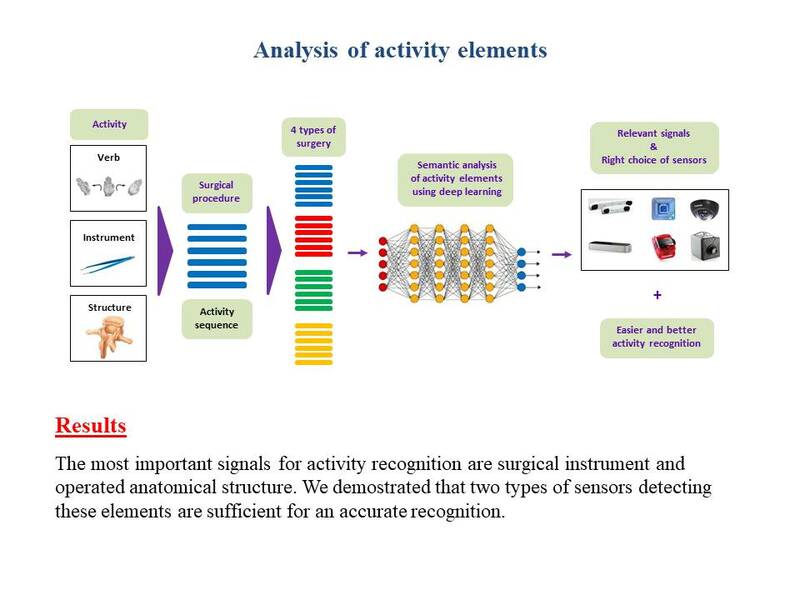 In our opinion, before recognizing surgical activities a careful analysis of elements that compose activity is necessary in order to chose right signals and sensors that will facilitate recognition. We used a deep learning approach to assess the impact of different semantic elements of activity on its recognition. Through an in-depth study we determined a minimal set of elements suffi- cient for an accurate recognition. Information about operated anatomical structure and surgical instrument was shown to be the most important. We also addressed the problem of data deficiency proposing methods for transfer of knowledge from other domains or surgeries. 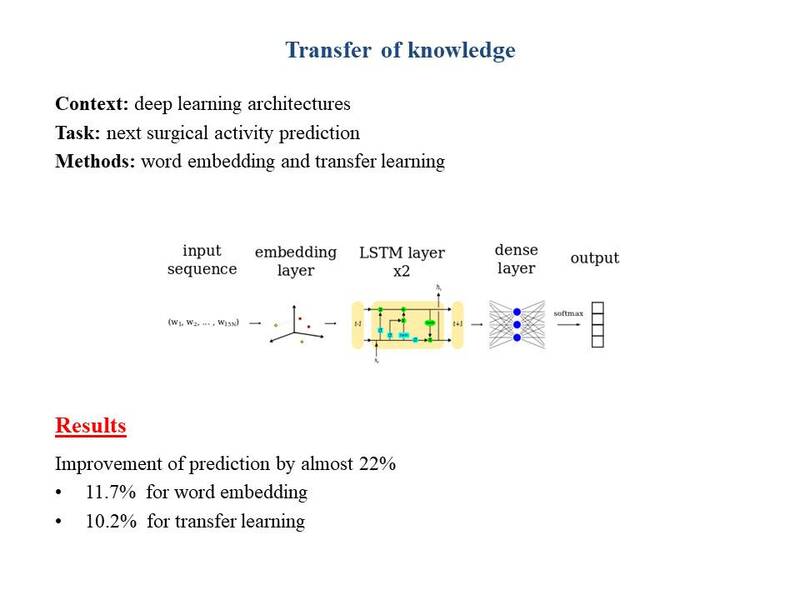 The methods of word embedding and transfer learning were proposed. They demonstrated their effectiveness on the task of next activity prediction offering 22% increase in accuracy. In addition, pertinent observations about the surgical practice were made during the study. In this work, we also addressed the problem of insufficient and improper validation of recognition methods. We proposed new validation metrics and approaches for assessing the performance that connect methods to targeted applications and better characterize capacities of the method. 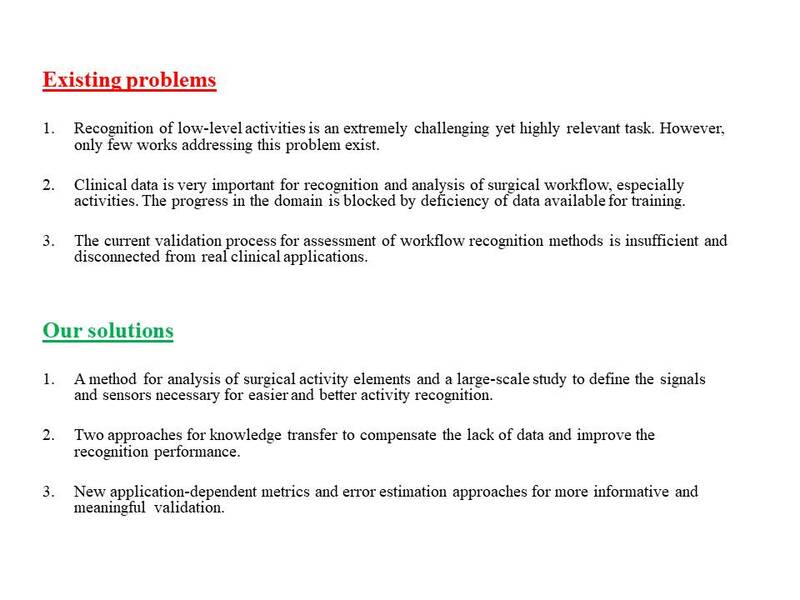 The work described in this these aims at clearing obstacles blocking the progress of the domain and proposes a new perspective on the problem of surgical workflow recognition. Dergachyova, X. Morandi, P. Jannin. 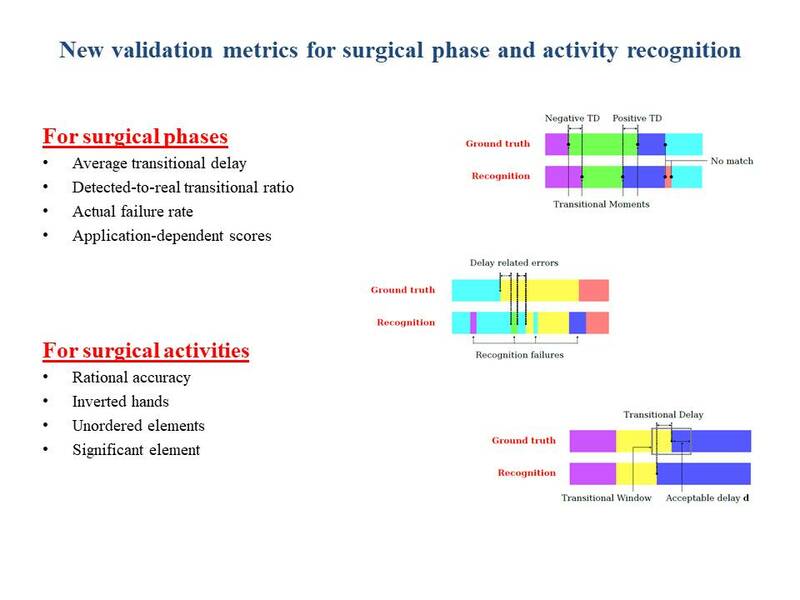 Sensors evaluation for low-level surgical activity recognition. Surgertica, Strasbourg, 20-22 November 2017.